Made up of almond flour and peanut butter, these chocolate muffins are extremely healthy. Well, who doesn't like to eat those soft, yummy chocolate muffins? But muffins that are available in the grocery stores are made up of refined sugar and flour. These ingredients have several health hazards. Eating these muffins can lead to weight gain and they provide no nutritional value. But you need not worry at all. 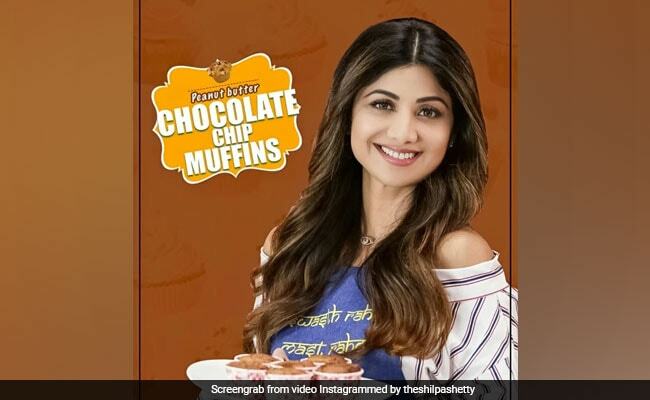 Fitness diva and a gorgeous actress, Shilpa Shetty Kundra shares a wonderful dish which is perfect to binge and fulfill your sweet cravings. Shilpa uses all the healthy ingredients to make this delicious dish. Rich in protein and fibre, the dish can help in quick weight loss, gives you energy, aids in digestion and boost your immunity as well. Watch video to see how this healthy dish is made. Almond flour which is also known as almond meal, is a healthy alternative to refined flour for baking and cooking. Almonds are rich in calcium, healthy fats and have significant amounts of protein. This flour is rich in essential vitamins and minerals like iron, potassium, calcium, magnesium, vitamin E and riboflavin. Gluten-free, low in carbohydrates, high in fiber and a good source of protein almond flour is a perfect option for your cakes, cookies and muffins. Almond flour improves the heart health, protects against certain type of cancers, lowers blood sugar levels , aid in weight loss and boost energy. The other main ingredient that goes into this dish is peanut butter. Nut butters are extremely rich in protein and a great way to add protein to your diet. The nutrient proteins is extremely important for weight loss as it boosts metabolism and curbs your hunger pangs. Peanut butter is a thick paste made up from from dry, roasted peanuts this nut butter is extremely delicious. Rich in protein and healthy fats it helps in weight loss, manages diabetes, helps lower high blood pressure (potassium content) and lowers cholesterol levels. Apart from these two key ingredients, Shilpa uses eggs, date puree, honey and unsweetened chocolate chips. Instead of refined sugar, Shilpa Shetty uses some healthy alternatives such as date puree and honey. Even the chocolate chips that go into this dish are not sweet. With not a single unhealthy ingredient, you can have this dish in your breakfast, give it in your child's tiffin box or have it as your evening snack. The next time you crave for something sweet, try these peanut butter chocolate muffins. Easy to make and rich in vital nutrients, you should give this dish a try.